The first stage of the SpaceX Falcon 9 rocket returns to land in a time exposure at Cape Canaveral Air Force Station, on the launcher's first mission since a June failure, in Cape Canaveral, Dec. 21, 2015. RBTH presents a selection of views from leading Russian media on international events, featuring reports on the possible implications for the Russian space industry of the U.S. success in returning a rocket unit to Earth, the granting of expanded anti-terrorist powers to Russia’s security forces, and the consequences of Ukraine’s imminent entry into a free trade zone with the EU. 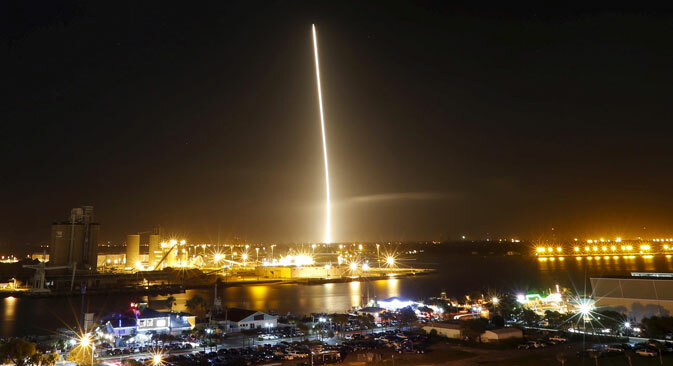 The daily newspaper Vzglyad reports that U.S. company SpaceX's success in bringing back to Earth a unit from the Falcon-9 rocket in functioning condition is something really unimaginable. Now the delivery of cargo to near-earth orbit will be at least 10 times cheaper, writes the publication. Does this mean that the Russian Proton and Soyuz satellites will be left without a job? Experiments on returning the first unit of the Falcon-9 had been carried out since 2010. Only the eighth attempt, conducted on Dec. 21, 2015, was absolutely successful. The cost of the Falcon-9 launch is currently estimated at about $60 million. The unit returned costs $54 million. SpaceX will therefore lose only $6 million on the Falcon-9 if the unit is able to land by itself for further use. This could lead to a real revolution in the world space market since the delivery cost of one kilogram of cargo onto the Earth's orbit could fall to $1,100, which on average is 20 times less than on other one-time carriers. This would leave the Proton, Soyuz, Arian and Atlas satellites out of work, if it were not for one "but." Despite its variety, the Falcon-9 cannot replace, for example, the Proton, since the load-bearing capacity of the Russian carrier is 10 tons more. However, if the matter involved a large space apparatus weighing 20 tons, two Falcon-9s could deliver a 26-ton object into orbit at a cost of $12 million. One Proton can deliver a 23-ton object for $100-120 million. Therefore, using two Falcon-9s is more advantageous than one Proton, writes Vzglyad. The Kommersant business daily reports that officials of Russia’s Federal Security Service (FSB) will be allowed to use weapons for self-defense, as well as any means available, while fighting terrorism. They will also be permitted to take fingerprints without informing citizens in advance. State Duma deputies approved the bill on Dec. 22. In particular, FSB officials will no longer be obliged to warn people that they will shoot if the "delay" in shooting "threatens the life and health" of citizens, as well as that of the official. In "the conditions of self-defense" officials will be allowed to use "any means available," if they do not have "the necessary special means or firearms." The main innovation is the FSB's right to obtain "biometric data on the special construction of the papillary patterns of an individual's fingers and palms." Moreover, this individual does not have to be warned about the fingerprinting if the officials find "signs indicating his inclination to terrorist activity, recruitment or involvement in one way or another in terrorist activity." The Svobodnaya Pressa newspaper writes that the association agreement between Ukraine and the EU, which concerns the Free Trade Zone, will go into effect on Jan. 1, 2016. In order to protect the Russian market from an influx of European goods Russian President Vladimir Putin has signed a decree ordering Russia's Free Trade Zone with Ukraine to be canceled on the same day. Moscow had been holding talks with its Ukrainian and European partners for the entire year, but to no avail. Russia had proposed introducing a transitory period of 5-10 years. The Europeans suggested 3-5 years and in the end the sides could not come to an agreement. After the talks failed, the Ukrainian government began demanding that Russia maintain Ukraine's privileges, according to Svobodnaya Pressa. And this despite the fact that the Verkhovna Rada (Ukraine's parliament) recognized Russia as an aggressor country and President Petro Poroshenko introduced sanctions against Moscow. "The regime of economic privileges between Russia and Ukraine was stopped within the framework of CIS agreements," said Dmitry Solonnikov, director of the Institute of Modern Government Development. "Since these agreements are being annulled and Ukraine is inconsistent about wishing to exit the CIS entirely or just refuse separate agreements, it is logical that Russia will cancel the additional privileges for Kiev. Russia is not introducing any new restrictions; it is just canceling the privileges. Legally, Ukraine does not have any grounds to demand that these privileges be kept in place."